As we become more educated as a society in the wellness space, we are looking more carefully at what we put into and on our bodies. The trend is no different in the Nail Industry, and the divide between the bottom of the barrel “monster massage-chair” pedi and a quality wellness pedicure is quickly growing. As consumers become more educated, we realize that money spent in a quality nail salon is akin to buying organic food, avoiding toxic chemicals, and being socially conscious about how the people performing nail services are treated. It matters; and quality is not cheap. So why does a pedicure at one nail salon cost $20 while at another it’s $65? How does this math even make sense and how can this monetary gap be so wide? We, at SOAK, understand your concern. We get this question all the time. It can be confusing for a consumer and difficult to justify paying top dollar for a pedi when you can ease on down the road to the “monster massage-chair nail shop” and pay a fraction of the cost. Spending money on quality nail services does matter, and for more reasons than may be obvious. The answer to what a consumer is paying for when getting a wellness pedicure at a reputable salon can be broken down into three critical pieces: safety, quality, and ethical ownership. b) stand there and observe for at least ten minutes to make sure the technician scrubs that tub “like the top of the Chrysler Building”. He/she should then run heavy disinfectant with hot water through all those inner tubes for at least ten minutes before you plop your precious tootsies in …sorry plastic liners don’t cut it because those pesky germs splash right over the side. I promise you. Chances are the above mentioned deep clean process will rarely, if ever, happen. It’s simply not the way these places make money. Rushing people in and out like a fast food drive through is standard practice. If you get a quick rinse of the tub a brush off of old clipped toenails and a mildly clean towel... consider yourself lucky. Now here’s where things can really get dicey, grungy, scary, whatever. 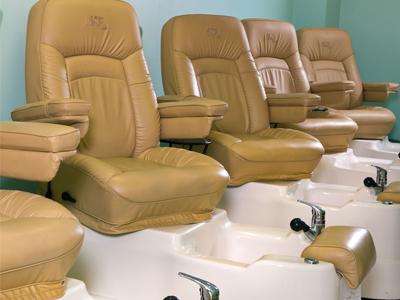 The basins of pedicure chairs can be drained out after each client, and even sprayed with disinfectant. However, the real hidden issue has to do with what goes down the drain. In fact, the screens and tubes of foot spas often harbor bio-film, which is basically layers of cells and proteins which can be hard to remove and more importantly, cultivate bacterial growth from other people’s skin or the water supply (in certain areas). So, what this means is, even a little wipe down isn’t doing much since it’s all the stuff you can’t see in the filtration and drain systems which is the real problem. You must ensure that the basins and the inner workings are disinfected after each use and cleaned nightly. Melisa is right. With these types of pedicure chairs, you are basically gambling that the person before you are clear that nasty little staph infection, she picked up months ago. Oh, and that tiny little blisters on your foot? Well that is just a superhighway for her staph infection into your bloodstream. Fingers crossed that doesn’t happen. I know it’s gross. But now you know, and you can never “unknow.” My advice. DO NOT SOAK IN THOSE TUBS. ...(the ONLY caveat here is the small upscale salon who actually DOES take the time to deeeep disinfect the jets between clients. However, most upscale salons are getting rid of the “monster chairs” and moving toward a basin or bowl style pedicure. Any reputable salon will be happy to walk you through their detailed process of cleaning. Ask. Look for a salon that uses bowls instead of jetted tubs. This way each bowl of water is fresh and yours only. There is a big fat difference between disinfected tools and sterilized tools. Quality salons sterilize tools. This can only be accomplished with the use of an autoclave and you should ask to see it. Trust me any salon owner who has shelled out thousands of dollars for an autoclave to keep his/her customers safe will be as proud to show it to you as her new born baby. The autoclave bags your tools come in should be wrinkly and look a bit weathered. That means it has gone through the autoclave (just like dental or surgical tools). If that bag is clean and pristine, the salon is just trying to make it look as if they are using an autoclave. My bet…the salon doesn’t own an autoclave but wants you to think they do. You have been warned. If you see a glass container with blue liquid and tools shoved in it, you should be on high alert. Granted, this is a good first step and at SOAK, we sanitize before we sterilize. Many high-end salons will twice clean tools using a disinfectant and an autoclave. But just tools in a blue liquid? This would be like going into your dentist’s office for your cleaning and the doctor pulling out a jar of mouthwash with some old toothbrushes soaking in it. Imagine said dentist proceeding to use one of those soaked brushes to clean your teeth and gums? Ummmm. Nope. Hard Pass! Finally, speaking of the medical field. Any high end and safe salon will also have testimonials and referrals from a locally well regarded podiatrist and dermatologist. Ask for them. Quality products cost money. Ask about the quality of products being used in the salon. Are the products organic? Does the owner take time to research and ensure the signature product line is ethically owned, not tested on animals and free of toxins? These types products cost money as they are refined and difficult to produce. Many “monster massage-chair shops” will drop ship products from other countries. These products are not regulated. Any guesses on what goes into those scrubs and lotions? I don’t want to think about it either. But they are cheap and can be bought by the gallon for next to nothing and then applied to your legs and feet for a truly luxury spa experience. Please. Gross. Look at the quality of polishes offered. Does the salon offer (or know) about 7& 8 free polishes? These polishes are free of toluene, dibutyl phthalate (DBP), formaldehyde, formaldehyde resin, camphor, triphenyl phosphate (TPHP), ethyl tosylamid, and xylene. Any high-quality salon will have at least one line of this type of polish. They do cost quite a bit per bottle so many salons avoid taking this extra step. SOAK loves Olive and June and their new line of fabulous polish, as well as edgy and smart Smith and Cult who carry a line of unique shades...all 8 free. Any top-quality salon will offer an option of polish that is 7 or 8 free. Ask for them. Finally, ethical ownership is something many quality salon owners are fighting for in our industry. When you see manicures and pedicures for unusually low prices, this is a major red flag that something shady is going on. Fortunately, a New York Times article about the rampant unethical treatment of employees in the nail salon industry lets us peek into exactly how many salons charge rock bottom prices for nail services. Selective Ignorance: The actual cost of your discount manicure, calculated to the penny By Tina Alberino breaks down how even more complex this issue is. Bottom line, she explains how exactly the “monster spa chair” nail salons operate. These shady salons hire nail technicians and mis-categorize them as independent contractors to avoid paying taxes. Rather they put that burden onto the worker, i.e. they commit tax fraud and put their employees’ futures at risk. · Hire a worker but insist the worker get her own business licenses. The salon then claims that the worker is an “independent contractor” yet controls them as an employee. · Insist the worker not collect money or keep money for services individually (payment is taken at a reception desk). Why is this good for the salon owner? Once classifying workers as “independent contractors” instead of employees, the salon gets to skip out on paying worker’s compensation insurance, employment taxes, wage obligations and other liabilities of an employer. Often these workers are more intrigued with a high commission, cash payments and seemingly more money up front. But all money isn’t good money, and these poor workers are being cheated out of their benefits, safety and their future. In addition, most are not properly reporting their incomes to the IRS which will eventually catch up with the worker. A simple question of, “Are you an employee or an independent contractor” will tell you everything you need to know about the operation of a nail salon. If the nail service prices at a salon are rock bottom and too good to be true; they are. You as a consumer can bet this salon is cheating. They are cheating you out of your personal safety, cheating you out of a quality experience, cheating the community out of paying their share of taxes and cheating the poor nail worker scrubbing your feet. They are cheating workers out of their social security, workers compensation and future once the IRS catches up. A safe, quality and ethical pedicure should be looking like the obvious choice. Now you know. You can never “un-know” You have all the “Pro Tips”. When choosing where to get your nail services done, please make the best choice for your personal health, treat yourself to quality and continue to support nail salon businesses who follow the rules and are doing things the correct way. You will get what you pay for. I promise.